In Back to the Future, Doc sets the clock in the DeLorean to a day 25 years in the future. Today (2010, 6th July) is that day. Today was a really amazing day. 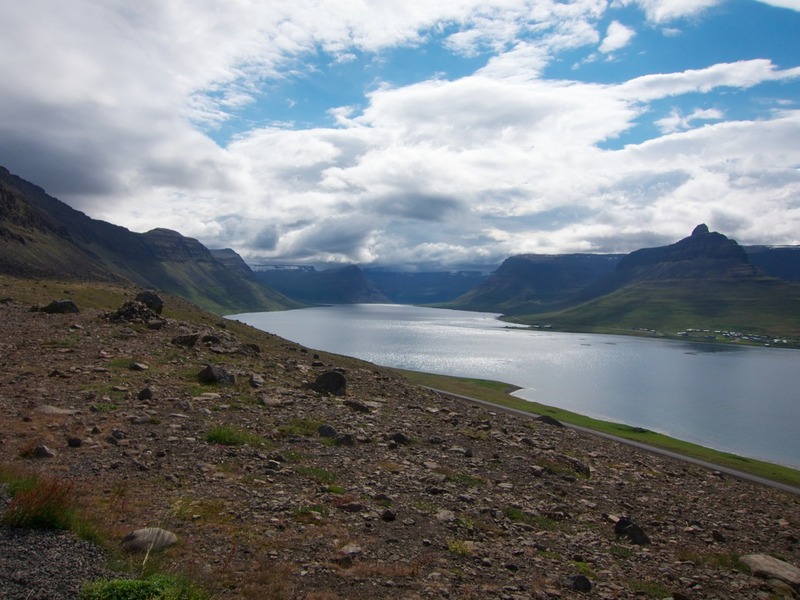 It was very sunny, and we visited Ísafjörður, a city that stole our hearts. We started our day with breakfast and taking a quick picture of Drangsnes' Rock troll. It does not look like a troll for us, but anyway. Does it look like a troll to you? Fueled at Holmavík, and then visited Holmavík's Witchcraft Museum. It was very interesting! It only costs 700 ISK with and included an mp3 player-audioguide. They also had an open wifi hotspot, thus we took a coffee while relaxing, at Kaffi Glaður while checking our mail and twitter. From Holmavík we drove to Reykjanes... Where we did not find Reykjanes' old pool... We just walked around for a while, then we went back to the car. Fueled again (it had been a longer drive than expected!)... This N1 station only offered gas, no food or anything else. No skýr, no market, not handcrafts. A boring stop, if not for the views! Hey! Look! The sky is more blue in Iceland! We started to drive around the fjord area, taking pictures all around. The day was sunny and warm... Incredible. It was the best moment for a change of weather, the views of the fjords were incredible. Ísafjörður is an awesome city. Probably this impression was heavily biased by the fantastic weather, but anyway. If I ever get to work whenever I want in the world, this is the place we want to stay. Parked in front of the information centre, where parking is free (which happens almost everywhere, in spite of what our travel guide explained). Walked around for a while, before having a look at the local Eymundsson bookstore, which had absorbed the old local bookshop. Nothing interesting, the same books we saw at Akureyri. But beside it we found a wonderful "store", mix of cafe and wool and handcrafts. We had a coffee with a rhubarb pie, very similar to my æblekage. We walked a lot around the city, under the sun. Wonderful, just wonderful. If you have the chance, visit this city. Tunnel! 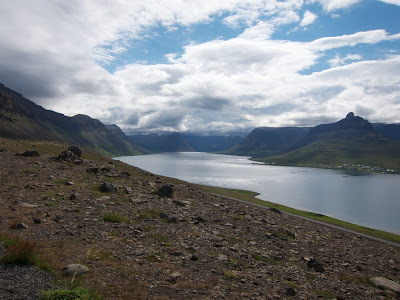 : a 9km tunnel, 4 of which were just one lane, between Ísafjörður and Flateyri. It even had a forking in the middle to drive towards Suðureyri. After the tunnel we stopped to collect seashells and take pictures of the surrounding firðir (plural of fjörd in Icelandic). Kept on driving, and before we realised it we were already in Þingeyri! Our "hotel" was not really a hotel, but a guesthouse without cooking facilities. Oh well... Shared bath and restaurant. Could be worse. We had a soup of the day with salad and bread for 1250 ISK, which is not that much, and as usual was really good. The bread was homemade, without salt but with sunflower seeds. Wonderful with butter! Went to sleep, expecting another sunny day tomorrow! Catch previous posts in Road Trip Around Iceland: The Index.